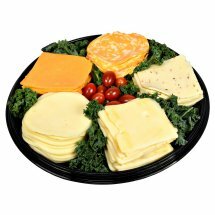 Includes cheddar, colby jack, pepper jack, swiss, and provolone cheeses. Garnished with cherry tomatoes. Made fresh in our Deli. Serves 8-10, 2.5lbs.